Medium - $80.99 Only 6 left! It's almost too difficult to intuit all the beer gulped down at Oktoberfest. Or just think about it all now, waiting to be tapped from innumerable chilled barrels, resting quietly, patiently, in some reinforced steel bunker with lines leading all over Bavaria, and finally pouring out of taps and into your stein. Yes, yours! Are you thirsty yet, you party animal? Imagine being there. You'd have your eyes on the prize: at least five of those 7 million liters and as many sausages. You don't know it yet either, but you are definitely singing some traditional tunes tonight—as loud and as proud as your heritage! Good for you, buddy. 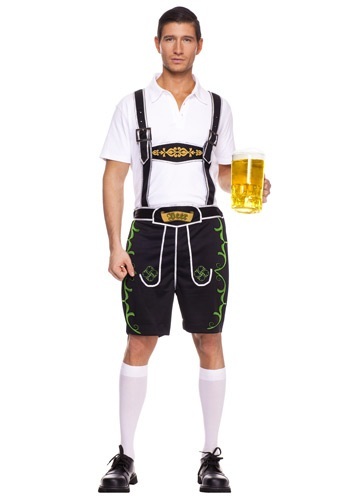 Sounds like a blast to us, but as long as you are stocked up on your favorite beer and bratwurst, this Men's Lederhosen is likely the only missing component to your perfect Bavarian-themed night at the Hofbräuhaus or elsewhere. Prost, friend!